New York, New York - Thumb, Inc.,a leading innovative mobile applications developer, has announced the recent update of their famous Thumb for the iPhone, iPod touch and iPad devices. Thumb is a wild social sharing utility that allows users to spontaneously share their opinions, ask questions and receive instant responses from Thumb community across the globe. Complete with pioneering social sharing options that allows users to share their thoughts, attach photos and flexible user friendly features, Thumb revolutionizes how we connect and interact digitally. Thumb is currently available as a free download on the App Store in the Social Networking category. Get ready for an entirely new spin on social sharing, offering a spontaneous approach to digital connection and the ability to get opinions of other users instantly and share your own on the fly! The app works by having users logged into the app using their Facebook account. 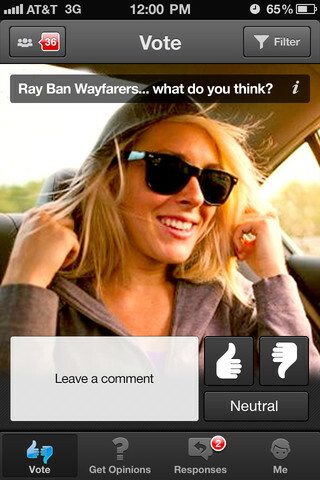 The app allows users to quickly upload a new post with either a thumbs up or a thumbs down attached. This feature lets people know if they like or dislike something, portraying your passions. Users can either give their own rating, add a comment or simply skip it. Users are able to add a rating to any of those comments, add your own text, or send individuals private messages that makes app even more attractive for a wide range of iOS users. Ask for an Opinion feature lets you ask your own questions and put it in the appropriate category and instant responses from Thumb community. With its recent update Thumb is now more practical than ever. The app now offers users the comfort as the app interface has been simplified to keep it easy, fast and fun so 5 tabs have become 4! Friend Tab Functionality has been added to Profile as well in order to provide users with a more flexible and functional experience. You connect with people spontaneously in real life, it's time to loosen up and make your social networking experience just as spontaneous. Get Thumb and just throw your opinions, questions, photos, and yourself out to the world! * iPhone, iPod touch, and iPad. * Requires iOS 4.2 or later. Thumb 3.7 is free and available worldwide exclusively through the App Store in the Social Networking category. Thumb, Inc. is an innovative mobile application developer dedicated to bring mobile user together in both the real world as well as the digital one. (C) Thumb, Inc.2012. All Rights Reserved. Apple, the Apple logo, iPhone, iPod and iPad are registered trademarks of Apple Inc. in the U.S. and/or other countries.